MILWAUKEE - It's the beer that made Milwaukee famous. Now Schlitz is making the city nostalgic. That beer with the old-time mystique is back on shelves in bottles of its original formula in the city where it was first brewed more than a century and a half ago. Schlitz was the top-selling beer for much of the first half of the 20th century. But recipe changes and a series of snafus made the beer — in many a drinker's opinion — undrinkable, turning what was once the world's most popular brew into little more than a joke. But after decades of dormancy, the beer is back. Schlitz' owner, Pabst Brewing Co., is recreating the old formula, using notes and interviews with old brew masters to concoct the pilsner again. The maker of another nostalgic favorite, Pabst Blue Ribbon, it hopes baby boomers will reach for the drink of their youth, otherwise known as "The Beer That Made Milwaukee Famous." They also want to create a following among younger drinkers who want to know what grandma and grandpa drank. "We believe that Schlitz is if not the, one of most iconic brands of the 20th century," said Kevin Kotecki, president of Pabst Brewing Co., which bought the brand that dates to 1849 from Stroh's in 1999. "And there's still a lot of people who have very positive, residual memories about their experience. For many of them it was the first beer they drank and we wanted to give it back to those consumers." In Milwaukee, the comeback is creating a buzz. Stores are depleted of their stock within days, they're taking names for waiting lists and limiting customers to just a few six- or 12-packs each. "For many years the product was associated with happy times, especially to people my age," said Jurgensen, who's writing a book on Milwaukee's breweries. "As we all know, the world is not the best it can be today. We used to think those were hard times and when we look back on them, those were the good old days." Schlitz' comeback has been slow, just like its fall from the top. It was tested in a few markets and is available in Minneapolis, Chicago and western Florida, besides Milwaukee. Its ties to the city are deep. Schlitz began its life at a brewery founded by August Krug in 1849. Joseph Schlitz took over and opened the Jos. Schlitz Brewing Co. several years later. Nostalgia could prove a driving factor in sales, Kotecki said. Pabst is certainly using it in its marketing, reusing its '60s-era advertisements urging drinkers to "Go For the Gusto" and simple maroon and gold packaging, marked with fanciful script. The Woodridge, Ill.-based company wants the brew to go national but is taking a slow approach, reintroducing it first in places like the Midwest where the beer was popular. Hearing from Schlitz-thirsty consumers prompted Pabst to revive the brand, Kotecki said. A malt-liquor form of Schlitz has been available for years in cans. But fans say it's not the same. The brew became a top-seller, Jurgensen said, after the Great Chicago Fire of 1871 wiped out its competitors. It was the world's best-selling beer from 1903 until Prohibition in 1920, and regained the crown in 1934 until the mid-1950s. That's when a strike by Milwaukee brewery workers interrupted production and made way for others, like St. Louis' Anheuser-Busch Cos. Inc., to eat into Schlitz' market share. That company, which makes Budweiser and Bud Light, has held the top spot to this day. Before it vanished, the beer changed — for the worse. According to Jurgensen, considered by Pabst to be the foremost "Schlitzstorian": First, brewery control shifted from immediate family members to more distant relatives, who wanted to expand the business. With demand high, the new owners wanted to make more, so they shortened the fermenting process. And they let customers know it through heavy marketing. There were also quality control issues for barley, so the beer went flat quickly. Customers associated the flatness with the quickened brewing time, and they weren't pleased. To fix the flat problem, the brewers added a seaweed extract to give the beer some foam and fizz. But after sitting on the shelf for three or four months, the extract turned into a solid, meaning drinkers got chunky mouthfuls. And then, the biggest of errors. "They decided not to pull their product off the shelf," Jurgensen said. "They decided to weather the storm and sell that product. That's the worst possible mistake they could have made." Floaters? Flat beer? It was all too much for drinkers to swallow. And by 1981 the Schlitz brewery closed. The owners sold the brand to the Stroh Brewery Co. in Detroit in 1982, which eventually sold some of its lines to Pabst. The Schlitz revival is bittersweet for the former brewing capital of the U.S., which has seen its heritage slip away. Beer was once brewed at about 100 places in Milwaukee, Jurgensen said. The city was home to names like Pabst, Blatz and Miller Brewing. Those first two are long gone, their former breweries now an abandoned site awaiting redevelopment and a condo complex. And Miller is leaving too. This summer it became MillerCoors LLC in a joint venture with Molson Coors Brewing Co. The headquarters will move about 90 miles south to Chicago, though Miller says it'll keep jobs and breweries in Milwaukee. Miller, coincidentally, brews Schlitz for Pabst under a contract at its east coast facilities. Kotecki said he hopes to eventually have the brand brewed back in Milwaukee, once some changes at breweries in the city are made. Kotecki wouldn't disclose sales figures for Schlitz but said they are considerably smaller than for the company's top-seller, Pabst Blue Ribbon. In Milwaukee, it's at about 75 locations, including bars and liquor stores, though that'll grow when more is made. John Thielmann, 55, of Milwaukee, says his first sip of the new Schlitz sent him back decades. He remembered being a teenager — drinking underage, he noted — spending summers with family on Druid Lake, about an hour from Milwaukee. But when the formula changed, he started getting headaches after two or three sips, so he stopped drinking Schlitz. Thielmann, who works at a liquor store in suburban Elm Grove, said he was confident the new formula wouldn't fail him. He figured Pabst had put in enough effort that they'd get the old formula back. "That first sip was like 'I remember this. This is right,'" he said. 1849: German immigrant August Krug opens a small restaurant and tavern in Milwaukee, begins to brew beer and turns it into a brewery. 1850: Joseph A. Schlitz, 20, immigrates from Germany and works for Krug as a bookkeeper. 1856: Krug dies, leaving no offspring, and Schlitz takes over management of the brewery. 1858: Schlitz marries Krug's widow, Ann Marie. 1861: The brewery is renamed the Joseph Schlitz Brewery. Schlitz runs it with Krug's four nephews, the Uihlein brothers. 1871: The Great Chicago Fire destroys many of that city's breweries, giving Schlitz an opening to expand his business. 1875: Schlitz travels to Germany and is presumed dead when his ship sinks in a storm. Since he had no children with Krug's widow, the Uihlein brothers take over the brewery. 1893: The company introduces the slogan "The Beer That Made Milwaukee Famous." 1902: Schlitz surpasses Pabst as the world's best-selling beer after selling 1 million barrels that year. 1912: Schlitz bottles its beer in brown bottles, marking the first time a brewer does so. The dark color prevents light from spoiling the beer. 1920: Prohibition begins. The brewery makes soda, malt syrup and candy. It survives because the Uihlein brothers have extensive real estate holdings. 1934: Prohibition ends, Schlitz resumes production and retakes No. 1 sales spot. 1953: Strike by Milwaukee brewery workers hurts brewers like Pabst, Blatz and Schlitz, which lose market share to rivals such as Anheuser-Busch Cos. Inc. of St. Louis. 1954: Schlitz briefly rebounds to again be the world's best-selling beer. 1955: Anheuser-Busch takes over the top spot, which it still holds. 1975: Immediate family management of Schlitz ends and distant relatives and outsiders take over the operation. 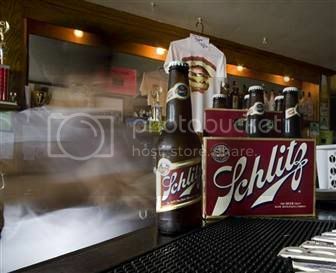 Mid-to-late 1970s: Schlitz still sells well, so the new owners try to make more by shortening the fermenting process. But the beer has no foam and is flat, so managers add a seaweed extract. But that turns solid after sitting in bottles for a few months. Schlitz sales fall and the old formula is gone. 1981: Production of Schlitz ends in Milwaukee when workers strike. 1982: Detroit's Stroh Brewery Co. acquires Schlitz and sells off many of Schlitz's plants to pay for the acquisition. It focuses on promoting Schlitz' secondary brand, Old Milwaukee. 1999: Pabst Brewing Co. buys Schlitz from Stroh. 2008: Schlitz reintroduces the classic formula.